M.Arch students can take a year-long UDBS studio, where they will design and build a house in a Pittsburgh community. Current M.Arch students present their work. "We created the Master of Architecture program to respond to the growing trend of the profession becoming more global, technical and research-based, and the growth toward more graduate programs," said Kai Gutschow, program track chair of the master's degree program. "In the past the school has focused our undergraduate program on design, and our graduate programs on research. 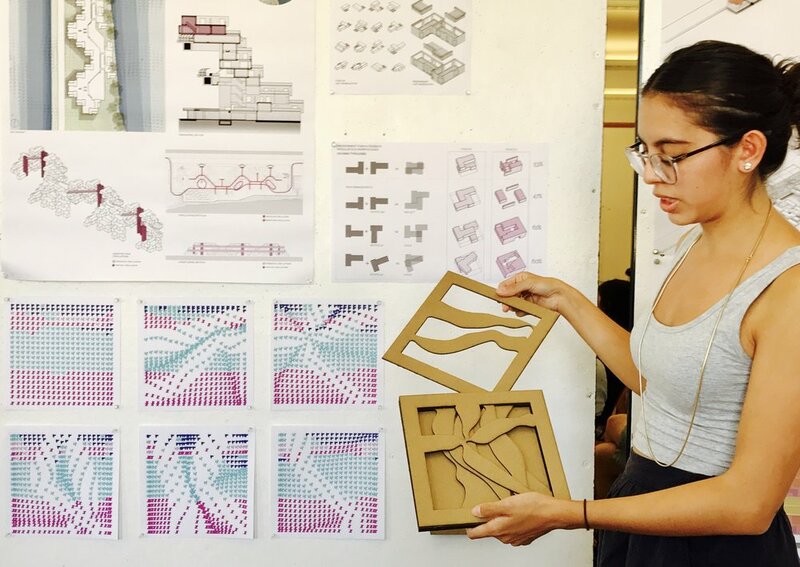 The new studio- and design-based graduate program is an opportunity to bridge those approaches." Track 2 is an advanced standing, 2-year/4-semester, full-time program for applicants with a rigorous 4-year pre-professional degree in architecture, an equivalent in a closely related field, or professional experience. For enrollment in the 2017-2018 academic year, admission was limited to students who qualified for Track 2. Gutschow said both the number of applications, and the number of students who accepted offers of admission were greater than expected, leading to a successful launch this August. The new Master of Architecture program combines CMU's 100-year tradition of training architects in the broad core competencies of the profession, with the opportunity to engage with elective coursework shared with other research-based masters programs. The core of the curriculum are design studios. Students this year are taking either the "Environment, Form & Feedback" studio followed by "Advanced Construction" studio, or a year-long studio in Urban Design Build Studio (UDBS), where students will design and build a house in a Pittsburgh community each year. The program’s small size allows students to shape individual educational agendas and career paths as they interact directly with leading-edge research projects in the school and community, and around the world. "In a crowded and competitive marketplace of graduate architecture programs, we want to build off the strength of the existing programs in the school specifically, and CMU more generally," said Professor and School of Architecture Head Steve Lee. "The M.Arch program will provide a strong foundation in the practice of design and technical fundamentals, and also will encourage students to begin to focus on the school's long-standing expertise in sustainability, computation and design by taking coursework and developing ties with faculty and students associated with these other graduate programs." Lee said M.Arch students will further benefit from access to the wealth of learning and research spaces available in the school including the Intelligent Workplace, Computational Design Lab, Design Fabrication Laboratory and the Urban Design Build Studio's PROJECT RE_. Applicants are encouraged to submit complete applications well in advance of the Jan. 15 application deadline for evaluation by the graduate admission committee.